Is The Black World Ready For The Fourth Industrial Revolution? If there really is an Illuminati – a secret society of the world’s most powerful people who run the world – then they probably gather at the World Economic Forum in Davos. Each year at the end of January, the invitation-only event hosts chief executive officers from its 1,000 member companies, as well as selected politicians, representatives from academia, charity organizations, religious leaders, and the media. The winter discussions focus around key issues of global concern (such as the globalization, capital markets, wealth management, international conflicts, environmental problems and their possible solutions). The theme of the 2019 gathering was “Globalization 4.0: Shaping a Global Architecture in the Age of the Fourth Industrial Revolution”. Like the Berlin and Beijing Conferences, African leaders and companies are largely absent from meetings like these – and there is one important reason why (explained later). As students and future Pan-African leaders, we must understand the implications of meetings like Davos, and industrial revolutions writ large. An industrial revolution happens when a society reinvents or reorganizes its economy towards large scale and machine based production. Things that were time consuming and difficult to produce by hand become mass produced and less expensive. Individual manual labor is often replaced by technology, and craftsmen are replaced by assembly lines. Items that took weeks and months to create by hand are manufactured in minutes and hours. Industrialization leads to a cycle of innovation that disrupts itself with increasingly more efficient configuration. Large machines become smaller, fast assembly lines become faster, and data becomes bigger and more usable by the machines themselves. Industrial revolutions have happened many times across many societies in human history. The first of these revolutions happed in the time before time (zep tepi) about 60,000 years ago. Our ancestors in Africa mastered language, tool making, group hunting methods, art, navigation, and farming. These innovations would lay the foundation for the great empires of Kemet (Ancient Egypt), Mesopotamia, and the Indus Valley. The Stone, Bronze, and Iron ages all represent stages of industrial revolution in ancient human history as well. When the world speaks of the modern industrial revolution, it is the British revolution that they are discussing. And if there was one resource that sparked the revolution in England, it was cotton. The British textile industry involved several fabrics, and before the industrial revolution, the dominant one was wool. However, cotton was a more versatile fabric, and was cheaper to grow and harvest than animal sourced wool. Before the revolution, clothing and textiles were woven by hand. But when demand exploded, manual laborers working in scattered facilities were unable to keep up. Investors flooded factories with cash to take advantage of the booming market, leading to the construction of more factories and new innovations. Factory workers were brought in from the countrysides as employees and the capitalist system was born. The explosion of development that Europe enjoyed during its Industrial revolution was in direct proportion to the underdevelopment of the African diaspora. In other words, the more advanced the rest of the world became, the less advanced Africa became. Colonialism was not merely a system of exploitation, but one whose essential purpose was to repatriate resources to the so-called mother country. From an African viewpoint, that amounted to consistent expatriation of surplus produced by African labor out of African resources. African trade strengthened British industry, which in turn crushed whatever industry existed in what is now called the “underdeveloped” countries”. And by crushing other economies, Britain could ensure that it had groups of people who were forced to buy their goods. That is why by and large, the Black world has been largely left out of the Industrial Revolutions. Today, many Farmers in Black nations still work their land by hand. Haiti, once a part of the Breadbasket of the Caribbean, imports most of its food. Most African public works (roads, stadiums, bridges) were financed and are owned by foreign nations. To date, only 4 Black countries have launched anything into space, with none achieving manned space flight. Only one African (South Africa) has a nuclear power plant. 67% of Black nations are in the dark. The governments of the world would have things no other way. Asian and European nations can continue to use Black nations to power their industries while selling products to Black consumers. Black leaders receive kickbacks from White and Asian corporations and governments, and use those funds to maintain power. Dictators become stronger, the people become weaker, and the rest of the world achieves ever higher levels of industrialization. Maintaining this balance is almost certainly what is being discussed at the Davos World Economic Forum. And it is probably no coincidence that the majority of Partners of the World Economic Forum on Africa are not African. One of the consequences of any industrial revolution is job loss. Since manual labor is replaced by technology, the entire workforce of a given society must be re-trained to operate the technology powering the new reality. Those who are able to adapt, learn new skills, and retrain themselves find an abundance of job opportunities and upward mobility. Those who fail to adapt are left behind. Industrialization gives nations the opportunity to create wealth at unprecedented scale, to improve the quality of life of its citizens, and to move into a position of leadership on the world stage. Unfortunately, industrialization also gives hostile and oppressive societies the ability to wage war, monitor its citizens, and unleash new horrors on humanity. Hitler’s regime was able to find, round up, and kill tens of millions of people based on their race, religion, and political ideology – and that was without technology. With access to Facebook and Google data, the Hitler of the future could kill millions more and do so far more efficiently. White supremacists of the past worked hard to monitor and control communications between members of Black organizations. Black informants were used as sources of intelligence and as weapons to undermine progressive Black agendas. With access to cell phone data, oppressors of the future will be able to silence individuals and destroy ideas effortlessly. 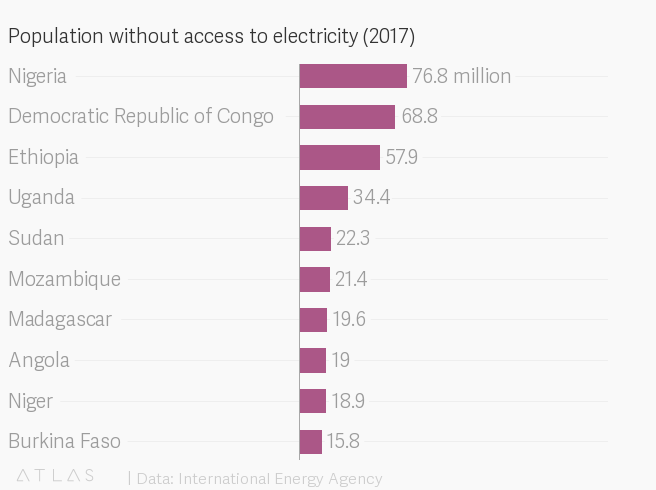 And dictators are able to pull the plug on entire nations (Cameroon and Zimbabwe) leaving citizens in a pre-technological stone age. Prior to Colonialism, Africa had civilizations whose technological achievements were on par with any other. Massive public works projects supported thriving urban populations with qualities of life better than that of their contemporaries. But when the white world set its sights on conquest, an ages long struggle called the maafa began. Colonialism saw the destruction of African civilization, the underdevelopment of nations under white control, and the destabilization of potential African superpowers during neocolonialism. While Black nations are far from prepared to take the lead, all is not yet lost. In order for Black nations (including Haiti, the Bahamas, Barbados, Jamaica, and Grenada) to both avoid the dangers and benefit from the Fourth Revolution, food security, energy, and good governance must become top priorities of every Black institution and individual. By increasing food production, the British population could be fed at lower prices with less effort than ever before. The surplus of food meant that British families could use the money they saved to purchase manufactured goods. The population increase in Britain and the exodus of farmers from rural to urban areas in search of wage-labor created a ready pool of workers for the new industries. Power is a key driver of industrialization and a nation’s productivity. Without innovations in power generation, the first European factories would have been unable to support mass production. The same is true of Africa today. African countries have the opportunity today to avoid getting locked into dirty, centralised fossil fuels and leapfrog to energy systems that are low-emitting, people-centered and decentralised. This is possible with renewable energies. In fact, there is more potential for renewable energy in Africa than anywhere else in the world. If tapped, this energy can power the African continent well into the next revolution. All of the causes of Africa’s underdevelopment can be attributed to corruption and intentional underdevelopment. Therefore, Africans must create and demand processes and institutions that meet the needs of society while making the best use of resources at their disposal. Put bluntly, if systems of justice, education, healthcare, and finance are not aligned to serve the collective then the Pan-African diaspora will find itself at the mercy of the rest of the world indefinitely.